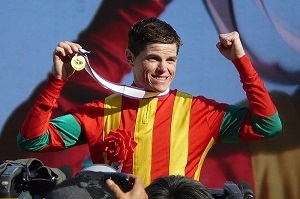 When you’re hot you’re hot and there is no one hotter than jockey Craig Williams at the moment. Elite sports people call it ‘being in the zone’, and wherever that zone is, ‘Willo’ is certainly there right now. At Flemington on Saturday Williams made history by riding six metro winners in an afternoon. However, he’s no one day wonder. His form this month has been a wonder to behold. At Sandown Hillside on July 4th Williams chalked up a treble, those amazing six winners at Flemington on July 7th and then another treble at Sandown Lakeside on July 11th. Williams has now ridden 12 metropolitan winners from his past 22 rides. The hoop has disproved two widely held beliefs. Firstly, that jockeys lose their nerve and killer instinct with advancing age. You only have to look at the video of William's win on Cataracta at Sandown Lakeside on July 11th to realize that this certainly isn't the case with him. He pushed the horse through a needle eye opening hard up on the rails to get up in the final stides. Had he gone around another horse there is no way Cataracta would have won. Williams may have ridden his first Cox Plate winner Fields Of Omagh well over a decade ago and now be 41 years old, but he’s never ridden better. Secondly, the view that one jockey is pretty much as good as another. Have you ever wondered just how much difference a top jockey can make? We looked at all of William’s metropolitan rides this month and found that on horses where he replaced another jockey, those horse’s performances improved by an average of 2.4 lengths. That’s not just his winners, but all of his rides. All jockeys go through lean spells, but when they strike form we should jump on board for the ride. A bet on all of William’s metropolitan rides this month would have returned you a profit of +251%. Just to confirm that Williams is currently riding at the peak of his powers, at the time of writing this article on Thursday afternoon, he had notched up four winners from four rides at the Sale races. An average little Benchmark 70 race on the Geelong Synthetic track on Tuesday reaffirmed that you can make money backing good priced winners simply by paying a little attention to detail. And you can spot winners that even the smarties can’t see. Aussieraces.com assessed the 7yo Lycka Till ($18.60 top tote) as the top rated runner in the race - in direct contrast to his market position as the clear outsider in the seven horse field. Ratings are useful but they don’t show the full story - so we did a bit of further research to find out why the horse appeared at the top of our ratings. The gelding was resuming from a spell over the 1200 metres on the Geelong Synthetic track - a course where he had won twice previously when resuming. Horses often repeat patterns in their form and when that form is winning form trainers will also attempt to repeat the feat. Going on that evidence we believed that trainer Alicia McPherson had aimed the horse at this very race. After all she trains at Kilmore and wasn’t taking Lycka Till on the 270 kilometre round trip to Geelong simply to take in the sea air. A study of the weights also revealed that the horse was weighted to win - thanks in part to apprentice Michael Poy’s 2 kilo claim he was carrying just 52.5 kgs on his back - 2.5 kilos less than he had ever previously carried in a race during his 43 start career. Going on the above information we had a real red hot go at the $20 odds offered by our bookie and Lycka Till played his part by scoring a last to first victory, winning comfortably in the end by a margin of over a length. Just to frank our assessment of trainer Alicia McPherson’s intentions, she commented after the horse’s win that Lycka Till “Does fire at Geelong first up - so that was the plan today”. Interestingly, Lycka Till didn't appear to be backed to any great extent and started as the rank outsider of the field - indicating that a lot of the pros had missed what we had been able to see pretty clearly with just a little bit of extra form study. Mark up one for the little guys! The 4 year old Belwazi (@ $3.50) scored a convincing victory over the 1000 metre scamper at Moonee Valley on Wednesday (June 27th 2018) Carrying half a kilogram below the minimum, and the best weighted horse we’d seen in a long time, the mare looked to have the race in her keeping a long way from home before she scored a comfortable 2 length victory. The win was the horse’s sixth from just 12 starts and it continued apprentice jockey Stephanie Thornton’s love affair with Moonee Valley where she has recorded an 18% strike rate this season. Just for good measure she also won the next race on Nordic Empire (@ $4.10).